NPPE is an uncommon complication of extubation in the early post-operative period and most commonly caused by laryngospasm. Acute laryngeal spasm results in airway obstruction and can cause life threatening pulmonary edema due to negative intra thoracic pressure. The incidence of NPPE has been reported to be 0.05 to 0.1% of all anesthesiology practices however it may be underreported due to failure of recognizing or misdiagnosing. The morbidity and mortality associated with under recognised NPPE is as high as 40%. We present a case of NPPE which progressed to acute subendocardial myocardial infarction. A 37-year-old male patient was referred to the emergency department due to developing of severe chest pain, hypotension, and dyspnea following septoplasty operation. On admission, the patient had on-going chest pain and was markedly agitated. Physical examination revealed blood pressure of 70/40 mmHg, heart rate of 75/min, bilateral diffuse crackles at the lung and wheezy breathing. Oxygen saturation was 60-70% while breathing high-flow oxygen through a face mask. 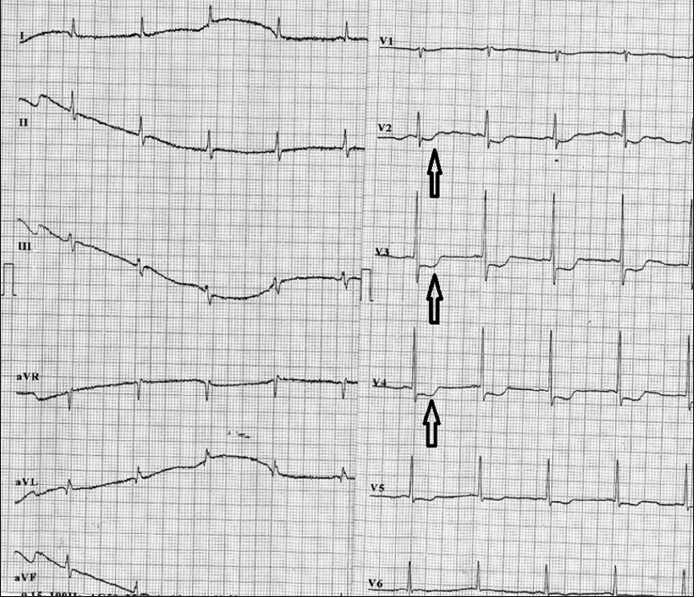 Twelve-lead resting electrocardiography (ECG) revealed deep and down-sloping ST-segment depressions of 3 mm in the precordial leads [Figure 1]. Due to elevated cardiac biomarkers on admission (troponin I level: 2,1 ng/dl and Creatine Kinase Myocardial Band (CK-MB) level: 7,4 mg/dl) he immediately underwent cardiac catheterization with the diagnosis of non-ST elevation myocardial infarction, acute pulmonary edema and cardiogenic shock. However coronary angiography showed normal coronary arteries. Bedside transthoracic echocardiography showed. Ejection fraction was normal, estimated pulmonary arterial pressure was not elevated and there was no evidence of thrombus in the main pulmonary artery. Thoracic CT scan did not show aortic dissection and pulmonary embolism. There was only increase in diffuse density of the lungs supporting congestion: [Figure 2]. After coronary angiography, the patient was followed in the intensive care unit. During the follow-up, his oxygen saturation and blood pressure levels were increased, chest pain, and dyspnea were improved with high-flow oxygen, inotropic support, and diuretics. Based on these laboratory parameters, imaging results and clinical course, the patient was diagnosed as hypoxia-induced acute subendocardial myocardial infarction, which is an unexpected result of negative pressure pulmonary edema. NPPE is one of the causes of non-cardiogenic pulmonary edema which occurs with increased inspiration effort and upper respiratory tract obstruction following upper respiratory, oropharyngeal, and nasal surgeries. The patient was discharged with full wellness on the fourth day of admission. There are some investigations which reports healthy, young, and well-built adults are more prone to NPPE because of their ability to further increase the negative intrathoracic pressure. , An entirely different population carries high NPPE risk which consist of the patients who are obese and patients who have obstructive sleep apnea syndrome, mediastinal mass, and upper respiratory tract obstruction. ,, Depending on the clinical circumstance, if diagnosed early, many patients do not need aggressive therapies but some patients will need invasive or non-invasive mechanical ventilation. Patients usually respond to well fluid restriction, diuretics and corticosteroids. To the best of our knowledge, we present the first NPPE triggered acute subendocardial myocardial infarction case in the literature. An interesting point need to be mentioned in our case. The diagnosis of NPPE was missed in the early post-operative period, and therefore, the clinical status of the patient deteriorated with time. The complains of chest pain and dyspnea were misdiagnosed as acute coronary syndrome, acute pulmonary edema and hypotensive shock in the emergency service. In conclusion, other than anesthesiologists, the cardiologists, pulmonologists, and emergency physicians must be aware of the NPPE, a diagnosis of exclusion, in the differential diagnosis of acute pulmonary edema. 1. McConkey PP. Postobstructive pulmonary oedema-a case series and review. Anaesth Intensive Care 2000;28:72-6. 2. Goldenberg JD, Portugal LG, Wenig BL, Weingarten RT. Negative-pressure pulmonary edema in the otolaryngology patient. Otolaryngol Head Neck Surg 1997;117:62-6. 3. Tami TA, Chu F, Wildes TO, Kaplan M. Pulmonary edema and acute upper airway obstruction. Laryngoscope 1986;96:506-9. 4. Gupta S, Richardson J, Pugh M. Negative pressure pulmonary edema after cryotherapy for tracheal obstruction. Eur J Anaesthesiol 2001;18:189-91. 5. Myers CL, Gopalka A, Glick D, Goldman MB, Dinwidde SH. A case of negative-pressure pulmonary edema after electroconvulsive therapy. J ECT 2007;23:281-3. 6. Pang WW, Chang DP, Lin CH, Huang MH. Negative pressure pulmonary oedema induced by direct suctioning of endotracheal tube adapter. Can J Anesth 1998;45:785-8. 7. Deepika K, Kenaan CA, Barrocas AM, Fonseca JJ, Bikazi GB. Negative pressure pulmonary edema after acute upper airway obstruction. Clin Anesth 1997;9:403-8. 8. Lang SA, Duncan PG, Shephard DA, Ha HC. Pulmonary oedema associated with airway obstruction. Can J Anaesth 1990;37:210-8. 9. Cascade PN, Alexander GD, Mackie DS. Negative pressure pulmonary edema after endotracheal intubation. Radiology 1993;186:671-5. 10. Nishikawa M, Chaffee TL, Goto H. Pulmonary edema induced by endotracheal tube obstruction: A case report. Respir Care 1993;38:479-81. 11. Perez RO, Bresciani C, Jakob CE, Perez CG, Coser RB, Honda LF, et al. Negative pressure post-extubation edema complicating appendectomy in a young patient: Case report. Curr Surg 2004;61:463-5. 12. Sharma ML, Beckett N, Gormley P. Negative pressure pulmonary edema following thyroidectomy. Can J Anaesth 2002;49:215. 13. Butterell H, Riley RH. 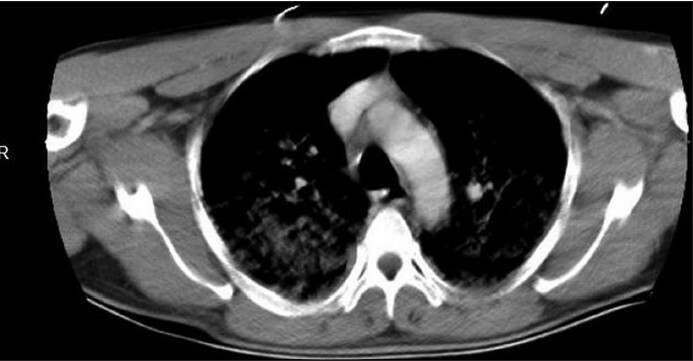 Life-threatening pulmonary oedema secondary to tracheal compression. Anaesth Intensive Care 2002;30:804-6. 14. Ikeda H, Asato R, Chin K, Kojima T, Tanaka S, Omori K, et al. Negative-pressure pulmonary edema after resection of mediastinum thyroid goiter. Acta Otolaryngol 2006;126:886-8. 15. Won HK, Seung AR. Acute pulmonary edema secondary to upper airway obstruction by bilateral vocal cord paralysis after total thyroidectomy. Korean J Anesthesiol 2012;62:387-90.